December, and Thursday 27th December, 2018. Thursday 3 rd January, 2019. 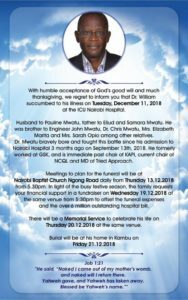 With humble acceptance of God’s good will and much thanksgiving, we regret to inform you that Dr. William Mwatu succumbed to his illness on Tuesday, December 11, 2018 at the ICU Nairobi Hospital. Husband to Pauline Mwatu, father to Eliud and Samara Mwatu. He was brother to Engineer John Mwatu, Dr. Chris Mwatu and Mrs. Elizabeth Marita and Mrs. Sarah Opiyo among other relatives. Dr. Mwatu bravely bore and fought this battle since his admission to Nairobi Hospital 3 months ago on September 13, 2018. He formerly worked at and is immediate past chair of Kenya Association of Pharmaceutical Industries and MD of Tried Approach. Meetings to plan for the funeral will be at Nairobi Baptist Church Ngong Road daily from 13.12.2018. Family requests your financial support in a fundraiser on Wednesday 19.12.2018 at the same venue from 5.30pm to offset the funeral expenses and the over 6 million outstanding hospital bill. There will be a memorial service to celebrate his life on Thursday 20.12.2018 at the same venue. Burial will be at his home in Kambu on Friday December 21, 2018.